Khun Nueng takes a stab at helping one of our artisans with the creation of this rice box. Meeting up with our Artisans is undoubtedly one of the most rewarding things we get to do here at Artifactio. We often set aside entire days just to sit with and meet our artisans and their families who make our unique and beautiful artifacts. It makes the work involved with photographing their products and writing the associated product descriptions so much more rewarding and rich. 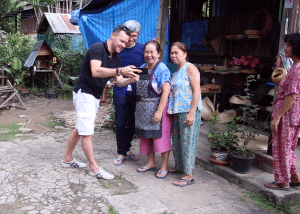 Our last product sourcing trip took us about 40-minutes north of beautiful Chiang Mai in north Thailand, where we went to visit the home of Khun Pongpang (our manager responsible for all things related to packaging and shipping). 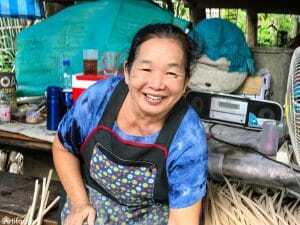 Many members of her family are involved in the manufacturing of rice boxes and the entire home and yard is filled with with bamboo and supplies. Its clear that this work isn’t just a regular job but in fact a calling and a lifestyle. No need for work-life balance when the two are one! Her aunts explain how they like the work as it allows them to work from home and during hours that meet their needs – since they also need to tend to chores at home, cooking and taken care of children. Life moves at a noticeably slower pace and that is a good thing. It also goes someway in explaining the incredible beauty and detail found within these products. This is not a job that can be rushed, sped-up or mechanized. 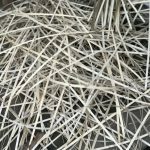 The basic structure of these rice boxes have been created and they await being coated and painted. What is really rewarding to see is the joy they take in their work. There is no sign of it being a stressful of rushed job. They chatter along as they go and appear to be doing it almost as a fidget during what would be a normal family sit down. 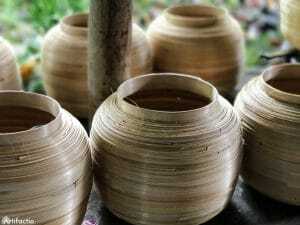 I personally wonder where they find the patience and meticulousness in their hands to ultimately makes these beautiful items. Whilst I speak little Thai personally, the few snippets I do pick up suggest that the ladies are discussing pretty much everything from cooking recipes to the state of Thai politics and the latest village gossip. The continued break into laughter suggests that none of these conversations are in any way stressful or serious though. Occasionally they pause to explain their work to us as they move on to another step in the creation of the rice boxes. 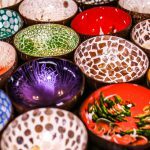 Whilst they appear to almost be able to make these in their sleep, it is clear to all of us that the craftsmanship (or should I say craftswomanship) required to make these items is extremely high and they have been taught this skill over many many years. 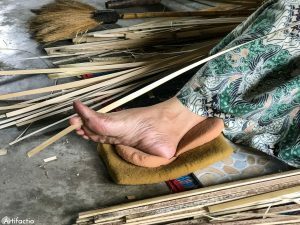 Getting hands-on/ feet-on with the bamboo strips that will ultimately become Thai rice boxes. 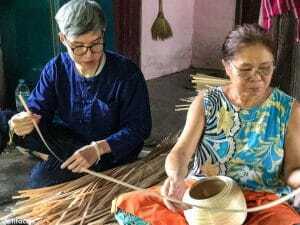 But it’s not just Khun Pongpang’s family that are involved in this trade, the entire small village seems to be involved in different stages of the production process of different handicrafts, furniture and fabrics all with the distinctive Thai design elements. We are invited to walk across to the next house where we are greeted by another group of ladies who are responsible for putting on clay and glue on the basic structure of the rice boxes. Another group sitting nearby finally paint the rice boxes with great skill and in an abundance of colors. We are told that they can pretty much paint the rice boxes in any colors and with any design and we immediately order a full set of sizes with the Artifactio logo (watch this space, we hope to post them here in about 3 weeks!). We are far away from the mass production of machine-made deco items and that is a good thing! There are no production designs, standard-operating-procedures (SLA’s), templates or even measurement tapes. Everything is done by hand with allot of intuition, skill and heart. The sense of community and a common bond is strong here even to outsiders such as ourselves. I wonder if they would receive as warm a welcome in my neighborhood had they were visited in the way that we did. Our modern gear, phones and cameras and even our attire seems almost out of place in this very rustic setting.We pause and take a moment to show the ladies some of the great photos and videos we have taken of them. The colorful images immediately bring massive smiles to their faces and we are pleased to have given them something in return for the wonderful experience of having seen them work. As we leave we promise to return soon to show them the website and their end-products displayed with the photos and descriptions we have just captured. As we leave, I feel a sense of pride and honor to be able to bring their beautiful craftsmanship and skill to customers and audiences to the world stage. We are truly excited to be working with our lovely staff’s family directly and being in the unique position to not only sell their creations as they are (truly unique one of a kind pieces of art) but also to fund their venture at a much higher and more sustainable level than is the norm here. See our full range of hand-crafted artifacts here. Sharing some of our craft back by showing our artisans the picture and videos we just took. Khun Pongpang’s aunt demonstrating the great skill and craftsmanship required to make thee rice boxes. The universal language of a great smile and loving what you do – there’s a management book waiting to be written here! Khun Drum didn’t say much but was clearly very skilled at stripping the bamboo down to ever smaller strips. Thank you Evelin, they do some beautifully artistic work and we are honored to showcase it to the world and support them by doing so. Have a wonderful week ahead! Thanks for taking the time to bring these amazing artisans’ stories to the public. I wish you every success moving forward! Much appreciated Mike, we hope to continue serving our customers and artisans for many years to come. Do keep an eye out for new product launches and related stories.